Google’s decision to close Google Reader is the best thing to happen to the newsreader industry in a long time. Case in point: ReadKit 2.0 for Mac (at the Mac App Store), a full-featured newsreading client that supports a growing myriad of services. And ReadKit is well-equipped to meet your newsreading needs. 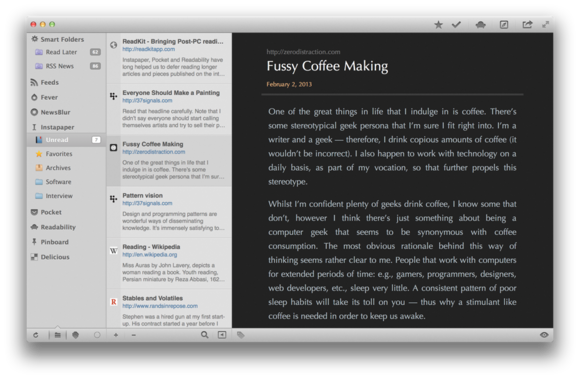 It supports Feedly, NewsBlur, Feed Wrangler, Feedbin, and read-later services like Pocket and Instapaper; it even downloads feeds on its own without a sync service. You can save and share articles via the services OS X supports natively like Twitter and Facebook, as well as via Instapaper, Pocket, Readability, Pinboard, and Delicious. It also does a good job of supporting the unique features of some services, such Pocket’s separate filters for regular articles, videos, and image links that you saved to view later. ReadKit brings a great deal of style and customizable features to the newsreading table, while keeping most of it out of your way until you want it. It’s a great app for the post-Google-Reader world. ReadKit is well-equipped to meet your newsreading needs.